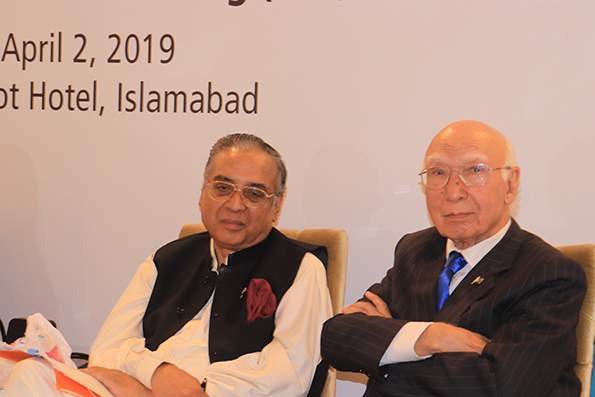 Academic, diplomat and politician Emeritus Hafiz A. Pasha and Sartaj Aziz at the launch of Pasha’s book on 'Growth and inequality in Pakistan'. 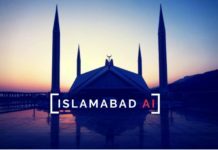 ISLAMABAD, April 2019: When Hafiz A. Pasha’s book of more than half a thousand pages, entitled ‘Growth and Inequality in Pakistan: Agenda for Reforms’, was launched in Islamabad last week, it was a star-studded event; among the dignitaries were the Minister of Finance Asad Umar and three other ministers. Dr. Pasha himself had been an economics professor and teacher of most of the senior officials present; and they too took notes when he spoke and gave advice on what do with the future government budgets. Not only is he a professor emeritus and former finance minister, but also a retired diplomat, having served as assistant secretary general of the United Nations and an assistant administrator of UNDP. 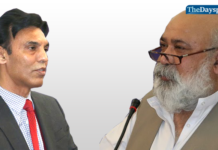 A key speaker at the book launch was another former senior UN official, Sartaj Aziz, who just turned 90 and is still going strong; he has served as minister of finance and in the previous government, a de facto minister of foreign affairs, termed adviser to the PM. He also served as a UN diplomat with the Food and Agricultural Organization (FAO), where he played a key role in the establishment of the International Fund for Agricultural Development (IFAD), working on poverty reduction. 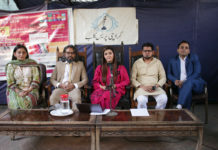 The event was organized by the Sustainable Development Institute (SDPI) and Friedrich Ebert Stiftung (FES). FES is named after Germany’s first president during 1919-1925, from the social democratic party (SDP). 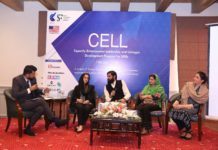 The speakers all took their time, having a lot to say about gender equality, environment, employment issues and poverty reduction. Hence, the high tea session was much delayed, but most participants waited for it, save for some of the diplomats who left early, possibly off to another evening reception. 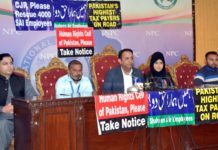 “I was indeed impressed by the presentations, and I look forward to reading the book or at least some of the 16 sections and 48 chapters, and certainly the summary booklet”, said a foreign diplomat. “It is indeed a treat to have such a comprehensive documentation, to the envy of many countries”, she added.